Haynes Manual 4925 BMW R1200 dohc (10-12). 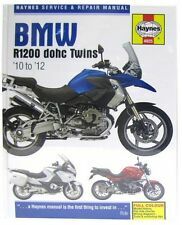 NEW Haynes Manual For BMW R1200R,RT,GS,GS Adventure 10-12 Manual Haynes BMW R1200R,RT,GS,GS Adventure 10-12. Whether you're a beginner or a pro, you can save big with Haynes! Part Type : Haynes Manuals. Weight : 668g. Complete coverage for your bike including Brakes, wheels and tires. Ignition and electrical systems. Manual Haynes for 2006 BMW F 800 S Haynes Manual 4872 BMW F800 (F650) Twins 06-10. F700GS 798cc2012 - 2016. F800GS 798cc2008 - 2016. F800GS Adv 798cc2013 - 2016. F800ST 798cc2006 - 2012. BMW F650, F700 & F800 Twins 2006-2016. F800GT 798cc2013 - 2016. F800R 798cc2009 - 2016. Haynes Manual. 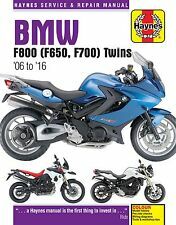 Manual Haynes for 2008 BMW F 650 GS (Twin cylinder 798cc) Haynes Manual 4872 BMW F800 (F650) Twins 06-10. 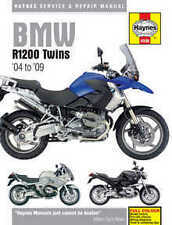 HAYNES REPAIR AND SERVICE MANUAL FOR R1200GS 1170cc 2004 - 2009. R1200GS Adv 1170cc 2006 - 2009. R1200RT 1170cc 2005 - 2009. R1200R 1170cc 2007 - 2009. Manual Haynes for 2010 BMW F 800 R Haynes Manual 4872 BMW F800 (F650) Twins 06-10. Whether you're a beginner or a pro, you can save big with Haynes! Part Type : Haynes Manuals. Complete coverage for your bike including Steering, suspension and final drive. Brakes, wheels and tires. Whether you're a beginner or a pro, you can save big with Haynes! Part Type : Haynes Manuals. Steering, suspension and final drive. Complete coverage for your bike including Brakes, wheels and tires. Manual Haynes for 2002 BMW F 650 GS ABS Haynes Manual 4761 BMW F650. Manual Haynes for 2007 BMW F 800 GS Haynes Manual 4872 BMW F800 (F650) Twins 06-10. Manual Haynes for 2009 BMW F 800 GS Haynes Manual 4872 BMW F800 (F650) Twins 06-10. Manual Haynes for 2008 BMW R 1200 R Haynes Manual 4598 BMW R1200 04-09. Manual Haynes for 2008 BMW R 1200 GS Haynes Manual 4598 BMW R1200 04-09. Manual Haynes for 2009 BMW R 1200 GS Adventure Haynes Manual 4598 BMW R1200 04-09. Manual Haynes for 2009 BMW F 800 S Haynes Manual 4872 BMW F800 (F650) Twins 06-10. Manual Haynes for 2005 BMW F 800 S Haynes Manual 4872 BMW F800 (F650) Twins 06-10. Manual Haynes for 2003 BMW R 1200 ST Haynes Manual 4598 BMW R1200 04-09. Manual Haynes for 2006 BMW R 1200 ST Haynes Manual 4598 BMW R1200 04-09. Manual Haynes for 2000 BMW R 1150 GS Haynes Manual 3466 BMW R850 / R1100 TWINS 93-06. Manual Haynes for 2003 BMW R 1150 GS Adventure Haynes Manual 3466 BMW R850 / R1100 TWINS 93-06. Manual Haynes for 2000 BMW R 1100 RS Haynes Manual 3466 BMW R850 / R1100 TWINS 93-06. Original handbook / manual as supplied with the motorcycle when new. Manual Haynes for 2009 BMW R 1200 RT Haynes Manual 4598 BMW R1200 04-09. Manual Haynes for 1998 BMW R 1100 GS Haynes Manual 3466 BMW R850 / R1100 TWINS 93-06. Manual Haynes for 1994 BMW F 650 Haynes Manual 4761 BMW F650. Manual Haynes for 2010 BMW F 800 ST Haynes Manual 4872 BMW F800 (F650) Twins 06-10. Manual Haynes for 2008 BMW F 800 ST Haynes Manual 4872 BMW F800 (F650) Twins 06-10. Manual Haynes for 1995 BMW R 1100 RT Haynes Manual 3466 BMW R850 / R1100 TWINS 93-06. Manual Haynes for 1997 BMW R 850 GS ABS Haynes Manual 3466 BMW R850 / R1100 TWINS 93-06. Manual Haynes for 2003 BMW R 1150 RT Haynes Manual 3466 BMW R850 / R1100 TWINS 93-06.